Blackdiamond’s Metal Mayhem First Show Of 2017! 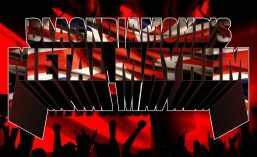 The first Blackdiamond’s Metal Mayhem of 2017 is from 6PM GMT on Tuesday 10th January, as always on http://www.totalrock.com! New singles coming up from OVERKILL, MESHUGGAH, THE SURVIVAL CODE, BURNT OUT WRECK and SUICIDE SILENCE along with a varied range of metal as always, from bands such as BULL-RIFF STAMPEDE, ARCH ENEMY, PITCH BLACK PROCESS, INEFFABLE ACT and more! Also featured ahead of them hitting UK shores this week, are ACCEPT and SABATON who are on the European “Last Tour”, three tracks from both bands – see you there metalheads! This entry was posted in Radio Shows and tagged ACCEPT, Blackdiamond's Metal Mayhem, Sabaton, TotalRock. Bookmark the permalink.